Explore writing. Start your memoir. Capture your family history. 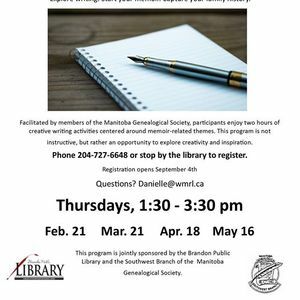 Facilitated by members of the Manitoba Genealogical Society, participants enjoy two hours of creative writing activities centered around memoir-related themes. This program is not instructive, but rather an opportunity to explore creativity and inspiration. The group meets on Thursday afternoons once a month from 1:30 - 3:30 pm. The dates are February 21, March 21, April 18, and May 16. 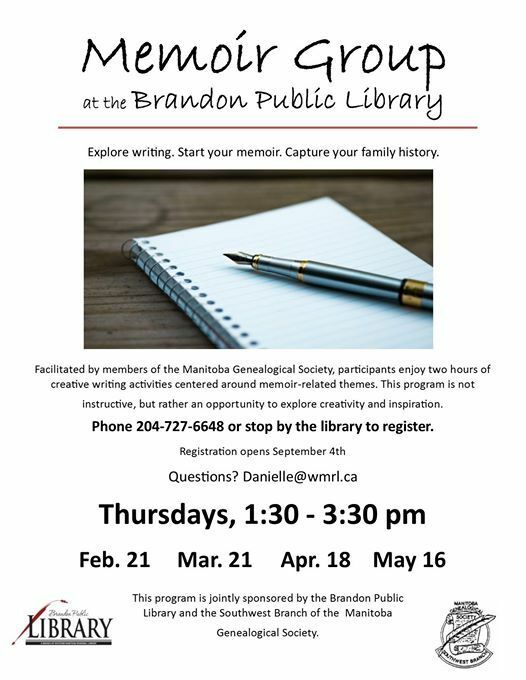 The program is jointly hosted by the Brandon Public Library and the Southwest Branch of the Manitoba Genealogical Society. Please register at the Brandon Public Library, or by phone at 204-727-6648. For more information, phone the library or email Programming and Outreach Librarian Danielle Hubbard at RGFuaWVsbGUgfCB3bXJsICEgY2E=.